Carrie Haddad Gallery is pleased to present “Gathering Ground”, a group exhibit of figurative painting, drawing, photography, sculpture, and works on paper that blur the lines between painting and photography. The exhibit will be on view May 3 – June 18 with a reception for the artists on Saturday, May 6th from 5-7pm. In a new series of landscape and still life paintings, David Konigsberg shares a renewed reverence for his surroundings in the Hudson Valley, where he has made his home for the past four years. Known for a conceptual realism that has, in the past, used landscape as a backdrop—and everything from angels to fantastical flying machines as characters and metaphors—with this series the artist moves the backdrop forward, in paintings that are more frankly personal and quietly revealing. An avid hiker, Konigsberg draws from long walks in farm country and frequent climbs among the peaks of the nearby Catskills and Taconics. Still, while his references are specific to the region, the new paintings transcend location to enter a realm that is tranquil, deeply spiritual and universal. Intimate in subject yet commanding in scale, the show’s accompanying still lives lift traditional flower painting into a grand and interpretive arena. The artist enjoys juxtaposing minuteness and immensity in these works, which rely on the blooms that flourish in his backyard garden, particularly his “accidental poppies between beds of unruly zinnias.” Working within the traditions of these genres, the paintings—executed on both canvas and panel—are funneled through a thoroughly 21st Century sensibility. Through expressionistic gestures and a sophisticated handling of paint, the works take on a life of their own, so that even inanimate objects seem filled with energy and intent. David Konigsberg lives and works with his wife, Peg, in Hudson, NY. Known for her large-scale relief constructions of creek beds and rock walls created from paper and Styrofoam, Linda Cross currently exhibits a rare view of her intimately-scaled variations of Hudson Valley landscapes. On view are works on paper and small relief paintings, including her current Field Notes series, which present faux rocks and rubble compacted in box-like formats resembling samples of material brought in from the field for study. Despite their small scale, these works powerfully illustrate Cross’s ongoing concern with the human impact on the environment and its ever-evolving process. As natural materials and manmade debris break down, new layers and new life emerge. The result is an approach that raises questions about the future while celebrating the earth’s beauty. Linda Cross exhibits throughout the Northeast region and has shown with the gallery for more than ten years. Birgit Blyth is one of our most innovative and prolific photographers who works in a darkroom yet uses no camera! Blyth has been experimenting with a technique known as Chromoskedasic painting since the early ‘90s and variations on this concept have been shown at the gallery for the last 20 years. The unusual process involves the use of silver particles in black and white photographic paper to scatter light at different wavelengths when exposed. A chemist of sorts, Blyth demonstrates a thorough knowledge of how the various photographic chemicals will react when applied to paper and exposed. Each work is unique with palettes that resonate brilliant tonalities of brown, green, black, and purple. 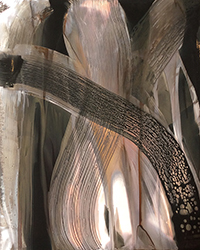 Using this technique, Blyth creates abstract crosshatching grids and most recently has developed a more gestural series of 20 x 16 inch chromoskedasic paintings that explores the ethereal qualities made possible by the unconventional material. Birgit Blyth succeeds at keeping her work fresh and cutting-edge using analog methods that are being quickly replaced elsewhere with digital technology. A recent visit to David Dew Bruner’s train depot converted artist studio in Valatie, NY confirmed that the man does not sleep. Nor has he entirely put to rest the various series of graphite drawings on paper presented in a stunning array of mid-century and antique frames that were exhibited at the gallery last year. The still lives and figures inspired by artists like Velasquez, Morandi, and Lindner are morphing on a continuum of brilliance; the highly graphic influences of the Italian futurists like Giacomo Balla and Marcel Duchamp, as well as the more obscure English Vortex movement have taken hold of Bruner’s intuitive approach to design as he channels it into his own drawings. The series of Infanta figures are emboldened with a new perspective and scaled up in size. A recent series of Arcs reference the gestural abstract shapes prevalent in the aesthetic of the Russian Constructivists. These works explore depth, movement, space and repetition that is more about design than reference. Bruner tastefully pairs drawings with a vintage frame from his collection, refashioning mirror frames from the 1960s or hand painting an antique Italian frame in lavender. One must see them all to believe! David Dew Bruner currently works and lives in the Hudson Valley. The upstairs gallery will feature a solo exhibit of the latest work by Brooklyn based photographer, Anna Collette, entitled ‘Gathering Ground’. In this series, Collette, captures vignettes of Live Oaks that were devastated by a flood in Central Texas. The once lush creek bed had been brought to a dry and ashen landscape, where the resilient Oak trees acted as a net, catching the scattered natural debris brought along with the momentous rush of water. Collette photographed the accumulation of limbs and branches caught in the trees. Week after week, she returned to the creek with a large 12x15 foot studio backdrop and made singular portraits of the trees and debris, fixating on their hanging limbs and severed sticks. The photographs, emphasizing the frail grey tree limbs strewn with forest material against stark white backgrounds, present haunting images of nature’s true power over our environment. In addition to concentrating on her photography, Collette is an Assistant Professor in the Department of Art & Art History at the University of Texas at Austin.